And a lot of change has occurred in this Otakus life. Shortly after getting back from Alaska, my employer posted a job opening that was pretty close to my dream job. I applied for it, and got it, and have been working really hard at it for the last three weeks. Which is why there have been few posts here of late. For the first time in a decade I am working fairly regular hours. When we came back from Alaska we really raced back, and it was for two reasons: one so I could spend my birthday with my beloved and saintly wife - who lets me do crazy things like go to Alaska for a month - and two, to close on a house. It seems the bank wouldn't let my wife buy the house without my signature. That's right, I bought a house. With two pretty kayaks nestled in the backyard. So if you are paying attention, I may have become an adult. I own a house, and have a semi-normal job (okay, I am still in outdoor education, so it isn't THAT normal). But do you know what buying a house means? I'll tell you. It means you buy stuff. I now own a weed wacker, can you believe it? I have had to buy a number of things for both the house, and working on the house, and if you read here a lot you know that I am a minimalist, and that it really hurts to add things to my personal tally of items, and so, that means that it is time for a purge! Starting September 1st I will be doing the purge I did a while back. It is called the minimalist challenge and I first read about it here. We are going to try and do it again. Are you with me? If you are, leave a comment here, or like this post on Facebook. I will post the occasional picture of the stuff I am getting rid of. Now I am wondering if getting rid of things the previous owner left behind counts....hmmm. The Thule Hullavator is an interesting product. Designed to assist in the lifting of your kayak onto the roof of your vehicle, it is a beautifully designed item, particularly if you are a smaller paddler. If you aren't familiar with it, here is how it works. This essentially removes 40 pounds of weight, as you lift the kayak. So in this video, he uses no effort because it is a small boat, for me, it would be the equivalent of lifting a 12 pound boat onto the roof. This is a great thing? Right? Particularly if you are a short paddler like me, or you have a tall vehicle. But there are a couple of problems with it. First is the price - $600. Though I did see it is marked down a bunch of places when I was researching this post - the second is the weight. It weighs 44 pounds. I will get back to why that is important in a minute. despite how awesome this thing looks, I had never seen one in the wild. Meaning on an actual paddlers car. The only place I ever saw them was at trade shows on display cars. But about two weeks ago, I saw five Hullavators in 3 days. I couldn't believe it. I saw these two when I was putting in my boat. I never saw the paddlers, I was very curious what they were paddling. The day before this I saw another hullavator on a different vehicle. But then the day after this I saw the ultimate. It is a little hard to tell in this photo, but that is two hullavators on one vehicle. Now I remember a Thule Rep telling me you couldn't - or shouldn't - do this. But as I peruse several sites I don't see any mention of that. In fact, when I googled it I found a lot of people are doing double Hullavators - which I feel I should point out would be $1200 before the cost of the base rack (which is at least $300) and all of a sudden you are at the cost of a pretty nice kayak! But here is the problem with the Hullavator - and particularly the double set up above - it goes back to the weight. 44 pounds per Hullavator. 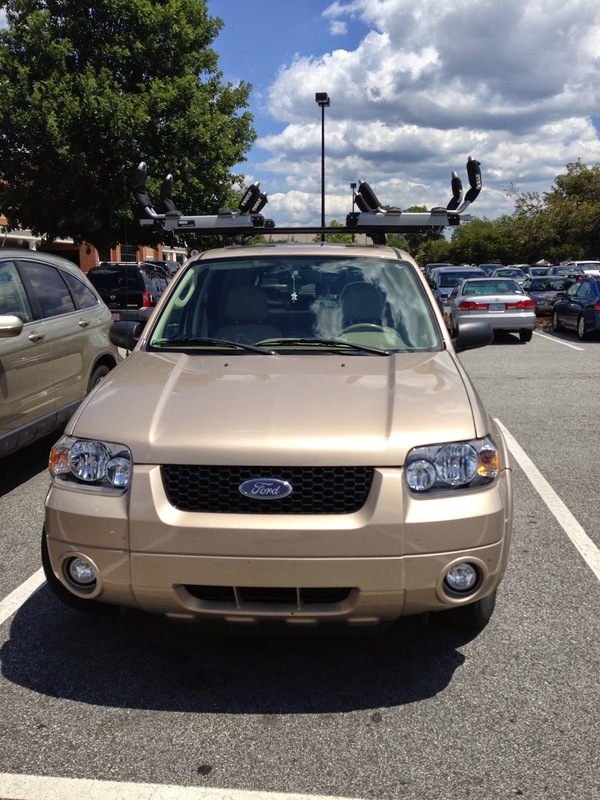 Most car racks will support a max weight of 165 pounds. Really, it isn't the car rack that is the problem, it is the roof of the car - Now, We all know that number is designed to be low, and I have had WAY over 165 pounds on the roof of my yaris, going to Alaska I had 150 pounds of boat alone! But still, you have to be safe... Right? So, 44 pounds, plus the weight of the base rack, another 15 or so and you are right at 60 pounds. That leaves you 100 pounds for gear on the roof. My seventeen and sixteen weigh 102 pounds combined. Now add on that second Hullavator in the picture above. Keep the math simple, two 40 pound Hullavators, and two 40 pound kayaks and you are above the weight of the roof before adding in the base rack. I can see using one, but two seems a little risky to me. 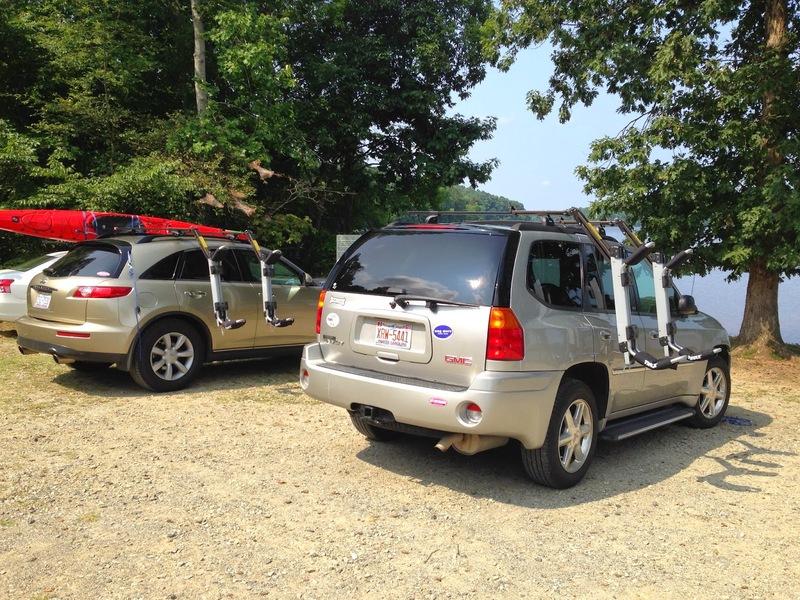 I have to say, I have used just about every kayak hauling device made by Thule and Yakima. I am currently using a Thule Base system, and love it. Though I prefer Yakima round bars, as they flex less. I have always preferred the Thule Glide N Set over the Yakima Mako Saddles and Hully rollers - if you are interested in why, let me know. For the most part J style cradles - which are what I am currently using, are pretty interchangeable. Though the current Thule Hullaports have a slightly different design that I like less than the old ones. But Thule has something that I think looks really nice, and as soon as I come up with a reason to purchase it, and sell a set of J cradles I will. It is this. This makes it easier to load, while keeping the boat flat, which makes for a better ride in the car. All of this seems like a lot of obsessing over something that shouldn't matter that much, but really does. If you load your kayak on and off your boat all year, you will learn what works and what doesn't. Like anything else it is easy to see when a product is designed by paddlers who have used it a lot, versus designed by a committee. I like the look of this product a lot. I look forward to trying it out. Spending a lot of time with the same group of people leads to some interesting conversation. Since both Beth and AJ are accomplished cyclists we talked a lot about long distance cycling and how it compared to long distance paddling. Aj is an avid gamers, so there was a lot of game discussion, and what makes a good game, or what keeps a good game from being great - his level of knowledge, and the ability to pick apart a game and isolate the subtleties of what works and what doesn't is staggering, he should really work in the gaming industry. - But Beth is a personal trainer, with a degree in Kinesiology. She is my go to person when I have a training question, and training and nutrition was a regular conversation. After talking with her, I realize I eat way too much protein, and will never have need of a drink like gatorade - and you probably don't either. I asked her to create a post for me that highlighted the exercises that would benefit kayaking. I did far less intensive pre-trip workouts on this trip, then I did for the Inside Passage, and I felt it. I will never let that happen again, and now i have a guide. 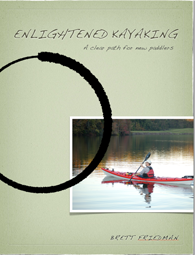 Below is Elizabeth Hansens Guide to training for kayak expeditions. Enjoy. 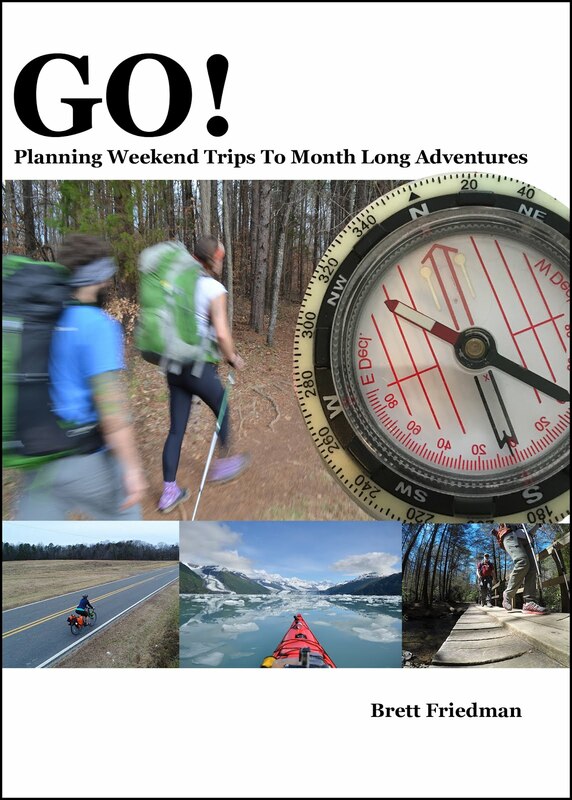 Preparing for an expedition is a time consuming process; from checking (and double checking) gear, arranging life to continue while you are away from home, and attempting to mentally prepare yourself for life in the backcountry, it is a journey of its own simply to prepare yourself mentally for all you will encounter. Whether it’s riding a bike, hiking up a mountain or paddling in less than ideal conditions, it is nearly impossible to completely prepare yourself for the awesome experiences that lie ahead of you. Calluses are never thick enough and it’s amazing how just an hour of cold rain can wash away one’s resolve. That is why physical and mental preparation are the key to any successful expedition. With that being said, here are some exercises I found helpful in my preparation for our expedition to Alaska (or wish I had focused more energy on before I left). Brett does a great job of breaking down the paddle stroke into phases and this article will follow the same format. Each exercise is specifically designed to target a particular element of the forward stroke and strengthen the stabilizer muscles involved. Proper body mechanics are impossible to achieve for extended amounts of time without sufficient muscular endurance. Therefore, it is recommended you do 3 sets of 10 repetitions. Each phase of the forward stroke is further explained here. 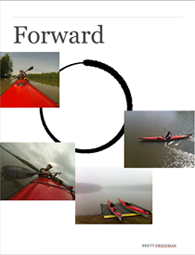 (note from Paddling Otaku - my current favorite version of the forward stroke lesson is in the free book "Forward" available from iTunes.) Start incorporating these exercises into your routine and almost instantly you will see a difference in the quality of your forward stroke! So don’t work harder, work more efficiently. Efficient bodies effectively utilize energy with minimal waste, making your expedition that much more enjoyable. -- Beth Hansen is a veteran personal trainer living and working in her hometown of Greensboro NC. She graduated from the University of North Carolina with a BS in Kinesiology and will finish her MS in Exercise Physiology in Fall of 2014. An ACE certified personal trainer, Beth is a NOLS graduate who specializes in conditioning established athletes and novice adventurers for various types of expeditions. Garmin, Kayakers would like this feature, please. On both the Inside Passage and the AGAP trip I used a Garmin GPS. In fact I used the same Garmin GPS, A Dakota 20. I am a big fan of GPS - despite the fact that I teach map and compass classes, I think they are two tools that work great together. Most of the time I use GPS as a check for map and compass work. But before I explain what features I don't see from Garmin, Let me explain how I use a GPS. I don't leave it on all the time. I know Geckopaddler does, and he creates great maps of all his paddles, but for me I would rather do that on paper. I guess I am old school in that way. Ages ago I pined for Garmin to make a simple tracking device. waterproof, two buttons. Long battery life. Mount it on your boat, bike, or pack, turn it on, activate it, and with no other interaction tracks your movements in three dimensions. When you get home, download it onto your computer and do with it whatever you want. It has no screen and no interaction other than that it is on and tracking. I imagine it looking something like a spot connect only smaller. A lot of people want to know the data from their run/ride/paddle, but that just isn't me. If I really wanted to do that, I could do it with a Garmin Fenix. I also don't generally load maps on my GPS. Repeat after me, you don't need to load maps on your GPS for it to be functional. All I need a GPS to tell me is my distance to a known location, and the direction to that location. If I know the distance and direction to where my car is parked, I know where I am. There are two times I have loaded maps on my GPS, when I was using it as a bike computer for my commute to work, I wanted roads on my basemap. When I did the Inside passage I loaded topo maps onto my Dakota. Let me just say they won't replace my charts and topo maps - though I do see digital taking over for this. It is only a matter of time until my iPad or something like it is inside my chart case. I do like the idea of having access to satellite images on my handheld, but honestly, I want them to be live, as in, I want to see the top of my own head in real time - or close to it. But that is a discussion for another time. So if I don't have my GPS on all the time, and I don't want maps installed, what is it I want? I want my GPS to be able to tell me the distance to two different way points at the same time. Here is why. The one time I leave my GPS on all the time is when I am doing an open water crossing. Here is a quick story. A handful of years ago I was paddling the South and North Core banks - Off the coast of North Carolina with a friend. We were in the position of having to make a final crossing - about 2 miles - to get back to the mainland and our car at the put-in. Unfortunately we got stuck at a tiny pile of mud - some would call it an island - before being able to make our crossing. We were stuck there by a series of squalls moving through the area. We waited out through one of them, and then realized we had a break long enough to make it across. My friend had a waypoint where the car was, and he told his GPSmap 60 csx to "goto" that waypoint. I made a waypoint where we were, and told my old etrex legend to "goto" that waypoint, even though it was right where we were. Here is why. As we paddled across the channel my friends way point would tell us how far we had to go, and mine would tell us how far we had come. So at any given moment we knew which way offered safety closer. I want to be able to do this same GPS trick with one GPS unit. It could be as simple as on the trip computer screen, a Distance to field, and a Distance from field. The other benefit of using this trick is that your compass bearing information gives you important knowledge about the path you are paddling. If you are paddling towards a point your bearing should stay the same (a heading is where your facing, a bearing is where you want to go) But if your bearing is changing that is because your kayak is being pushed left or right, while you are paddling forward. This is very hard to determine without a navigational aid - it can be done, but you need to be super aware, and paying attention to landmarks, and in an open water crossing with large waves, limited visibility, and a high level of stress, it is almost impossible. So Garmin, it would be great if you could help us out with this. A simple add to the features of your GPS's.